The modern and frantic pace of life encourages us to come up with the ways of fulfilling tasks briskly to keep up. Rapid wireframing is a product of our acclimatization. Maybe in the beginning, this seemed like cheating yet now we can’t do without it. Any business requires an own online property. Everyone understands that. As a result, the high growth rate of demand sometimes outpaces supply. In such situations, website and mobile UI kits come to the rescue. 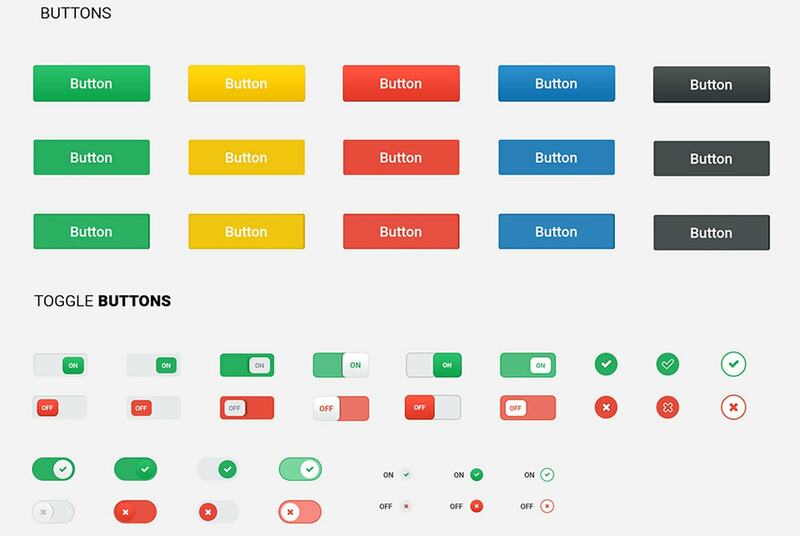 Even free versions can solve your problems, for example, Landing UI Kit. It includes everything you need to craft a landing page. 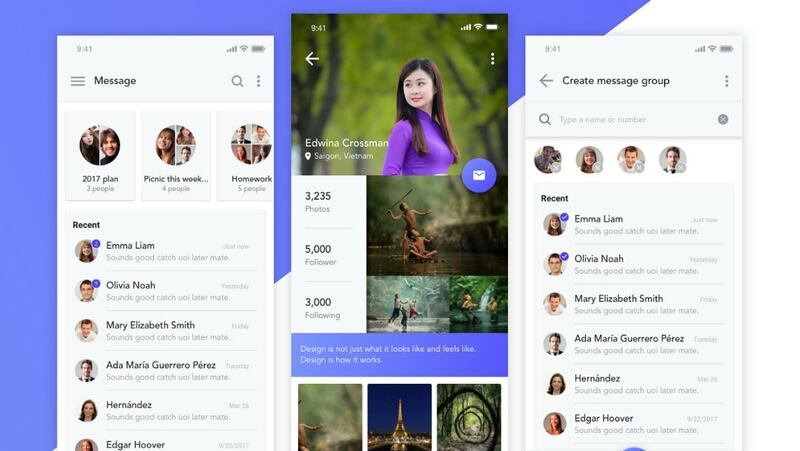 Or take a look at Material Design UI Kit by UXpin and Vera Block. Both of these mobile UIs include a ton of elements and screens that are available in several popular formats. They are suitable for building any application. 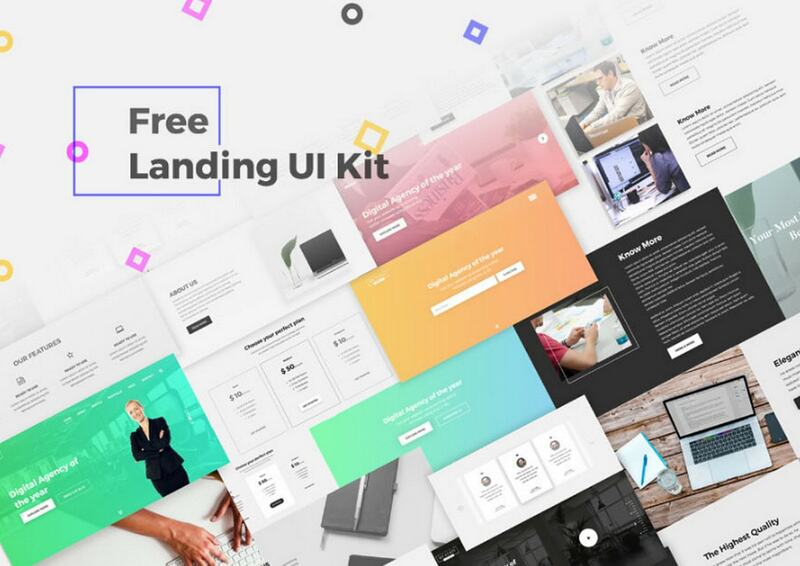 Free UI packs, whether they are for building a website or mobile layout, can give you a perfect start and save you from the routine of creating everything from scratch. Let’s examine free web UIs first. (For the majority of businesses, a website comes ahead of a mobile application.) We have several fantastic freebies in our collection that you may like. These four bundles are rich in vital elements. With beautiful neutral design, they can serve numerous purposes. For example, Consulex offers not only elements to build interfaces but also sterling web templates. You can create your masterpiece or use ready-made solutions. Visage is another tremendous bundle of graphical elements that assist in building clean designs. It includes different items from a gallery to an audio player. Iris has a ton of web elements. Inspired by the cards trend, it looks great. There are headers, footers, covers, CTA banners, video players and much more. Unlike UI sets that stick to modest and pastel color palettes, Kit by CSS Author will surprise you with its gamut of colors. Green, yellow, red, blue, grey, black and white are tones that are used. The freebie feels energetic and bold. Of course, not all free UIs out there are so big, comprehensive and versatile. As a rule, sticking to one specific theme, the majority of such stuff covers only the most essential components. However, it can be enough since you can easily build other components above the existent base. Following the styles, you can quickly recreate all the missing pieces of a puzzle. Consider Peach Dating by Basari Design, Take Me and Addstract as a firm foundation on which you can create. Peach Dating is made with dating services in mind. The schmaltzy aesthetics reflect it. But, it can be easily adapted for more feminine projects in case you do not want to change the coloring or use in other projects with tiny modifications. 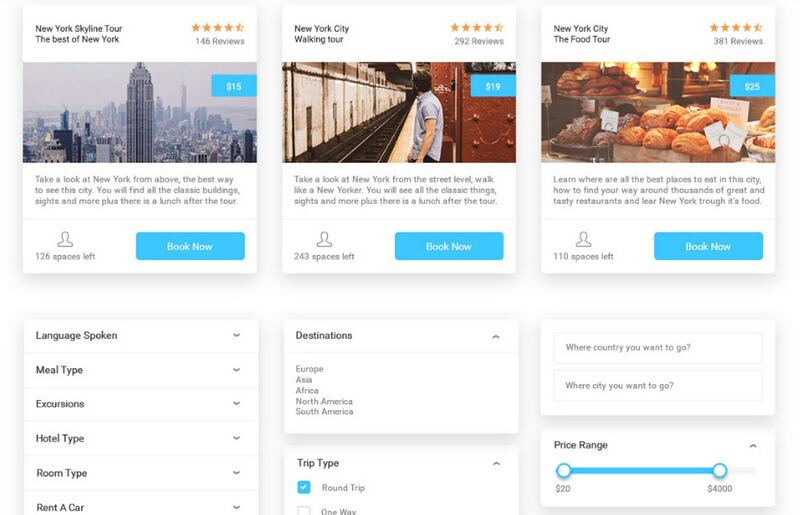 Take Me is a UI kit for building travel-oriented interfaces. Using Bootstrap grid as a base, it makes it much easier to be converted into the working HTML/CSS prototype. Addstract comes in two themes: light and dark. It includes specific components such as text blocks, stats and a set of general widgets. They cover all the essentials of the latest public release. Not only does Kit by Facebook include all the possible components and screens but it also comes in three formats — Sketch, Photoshop and most importantly Origami, which is used to show the behavior of elements. The package by Iosdesignkit is not as sophisticated as the previous one, yet it also has something to show off. Covering 60 general elements that are made with Human Interface Guidelines in mind it helps to build viable interfaces. The main flaw is that they are general and iPhone-like. However, on the web, you can stumble upon truly original UIs. 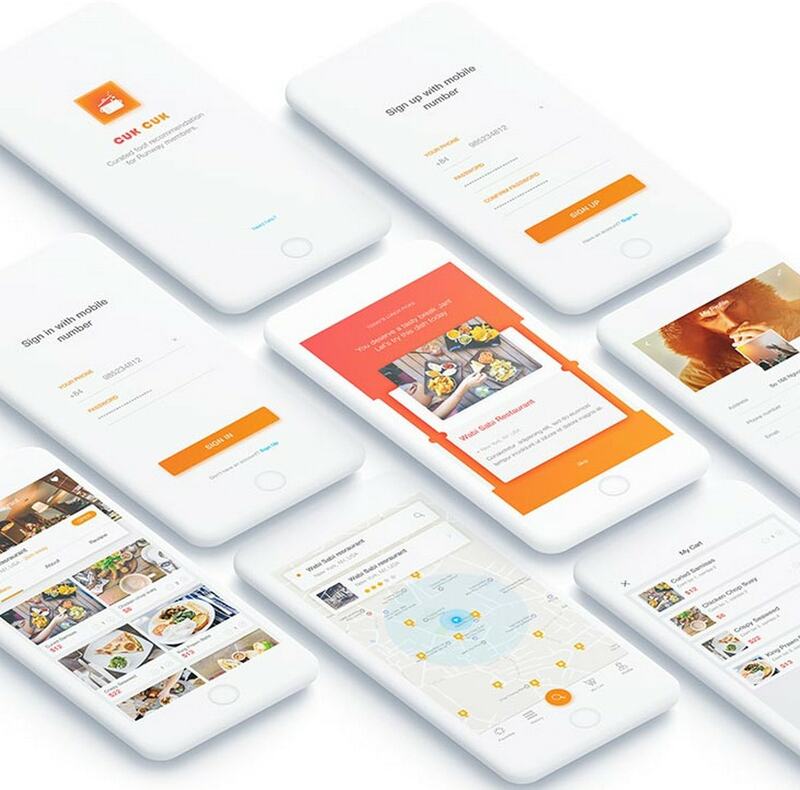 Consider Cook Application by CreativeTacos and Finance UI Kit. The nameplate of these freebies speaks for itself. The UI kit by CreativeTacos is for restaurant-themed interfaces. It has 20 screens including booking, menu, login, map, etc. 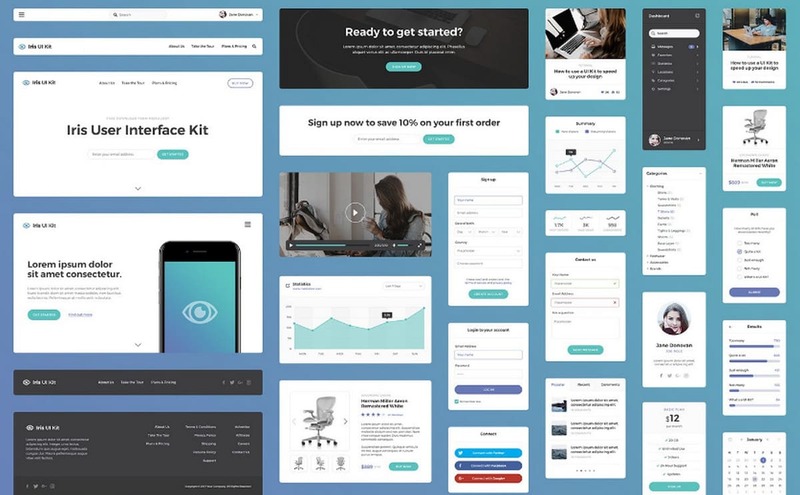 UI kit by 7ninjas offers 12 screens with stats- and finance- inspired standalone components to kickstart your projects right away. As a matter of fact, there are numerous specific UIs, but the most popular ones are those that centered on photography and e-commerce. With selfies taken everywhere, photography UIs are quite popular. If you need stuff for crafting your Insta-like concept, take a look at Moon Heart by Tung Vo Chi. 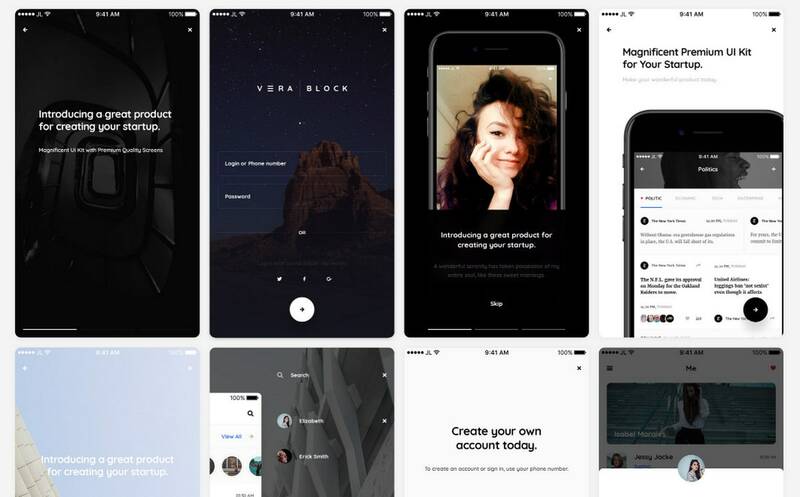 Tung Vo Chi has created a design of the application that lets you share images across the social media. It skillfully balances visual and textual data, resulting in a well-organized layout. E-commerce is another huge area. 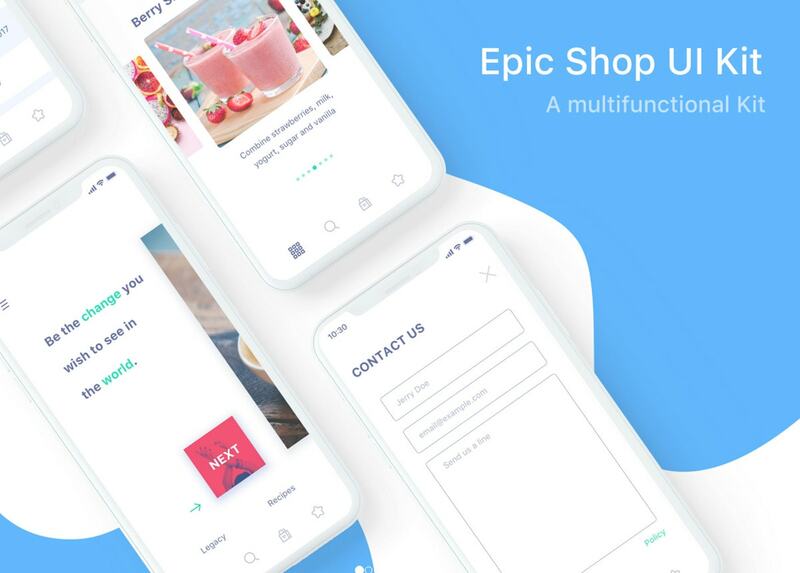 Epic Shop UI Kit by EpicCoders and Helen by Igor Ten are excellent examples of interfaces with well-balanced layouts. Both templates bet on light coloring and a ton of white space. All the images are well placed, content is readable, and the design is neither overwhelming nor content-heavy. We could not help but include assets for building dashboards. They may not be as huge as web and mobile sets, yet they are also in demand. 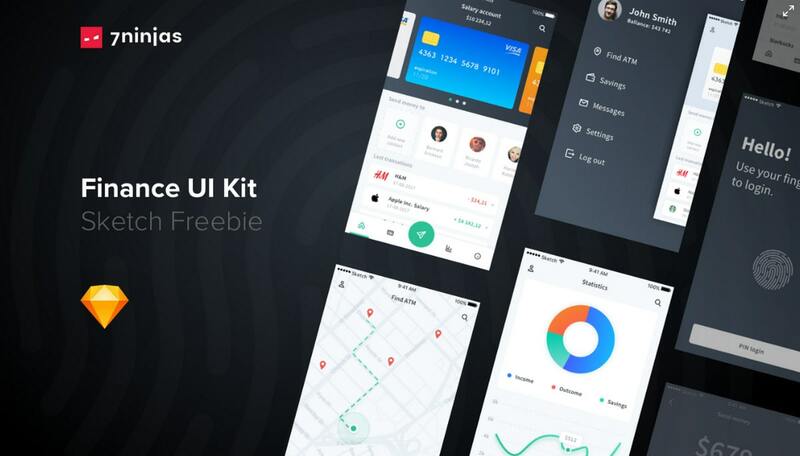 We have two freebies in this category, UI Kit Dashboard by Max Kalik and Carsive dashboard UI kit. Max Kalik gives away a small kit with elements that are suitable for crafting classic dashboards. 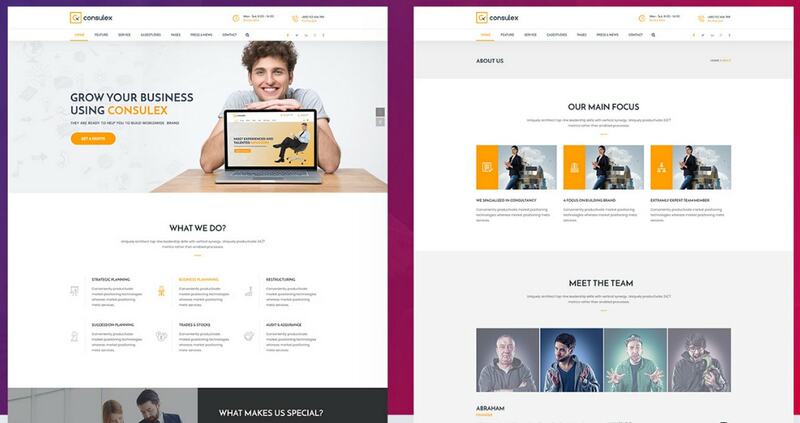 The pack consists of the main page, numerous modules, guidelines, pop-ups and a ton of tiny elements. 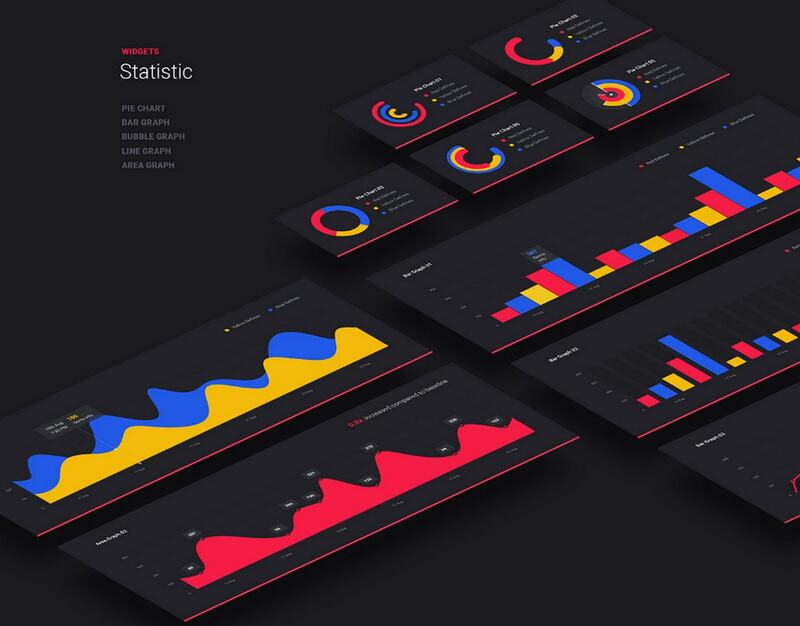 Ahmed Hasan Baky shares a mega bundle to craft statistics-inspired pages, modules and widgets. 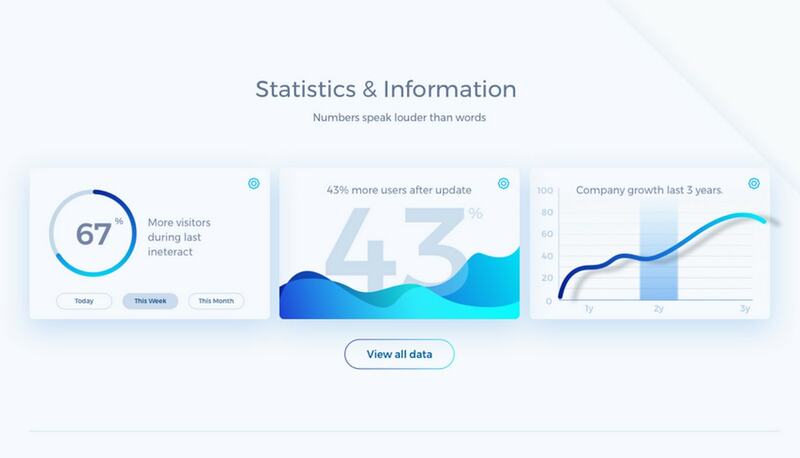 Using black as a background and several bright colors to showcase graphs the artist was managed to give the design an outstanding look. Quick prototyping is a huge part of our life. It helps to fulfill tasks in a short span of time without sacrificing quality. You can find assets to create different interfaces. Of course, creating something from scratch is an adventure that everyone is eager to take; but sometimes time constraints make freebies come in handy. Do you find UI sets helpful? Do you use them in your daily routine?